New Zealand and South Africa's rugby unions have made landmark apologies for excluding Maori and black players from their teams during the apartheid era. 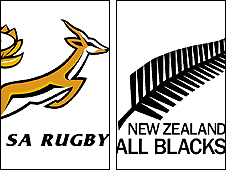 New Zealand toured South Africa three times without indigenous Maori players in 1928, 1949 and 1960. "We wish to say sorry to those Maori players who were not considered," read a New Zealand Rugby statement. South African Rugby president Oregan Hoskins also apologised, referring to apartheid as "these long, dark years". He also described those Maori players excluded from the tours as "innocent victims of the racist ideology of our former government". "But, even more importantly, this is the opportunity to apologise on behalf of rugby to black South Africans who were denied the opportunity to represent not only their country but also their provinces throughout those long dark years," he added. Hoskins also acknowledged the white players who opposed racist policies during the apartheid era from 1948 until multiracial elections in 1994 and said the union had worked to cast off the shadow of rugby's racially divisive past. "This acknowledgement of the mistakes of our predecessors and apology for our sport's culpability is another step in attempting to lift that shadow," he said. Friday's statements come nearly a week after South Africa's Sport and Recreation Minister, Makhenkesi Stofile, sent a public letter of apology to Maori players who were left out of tours to the republic. New Zealand rugby union had resisted building pressure to apologise this year, the centenary of the first New Zealand Maori representative team, arguing it was better to focus on celebrating the centenary rather than past controversies. But it performed a u-turn on Friday, with union chief executive Steve Tew and chairman Mike Eagle releasing a statement that read: "We apologise to the families of those players and to the wider Maori community who were affected directly or indirectly. "It was a period in which the respect of New Zealand Maori rugby was not upheld and that is deeply regretted. "The centenary activity has also prompted rugby to revisit and wrestle with the hurt caused by our sporting contact with South Africa during the years that black and other South Africans were subject to the oppression of apartheid. "We also wish to take the opportunity to apologise to New Zealand as a whole for the division that rugby's contact with South Africa caused across the country over many years."